Obsidian is a naturally occurring glass of volcanic origin, having an amorphous structure due to rapid cooling. It can be gray to black and often displays splotchy white patches or “snowflakes”. Obsidian can also be brown to orange or red and have bands or a sheen. Iridescent obsidian is known as rainbow obsidian. Small translucent rounded pieces are called Apache tears. 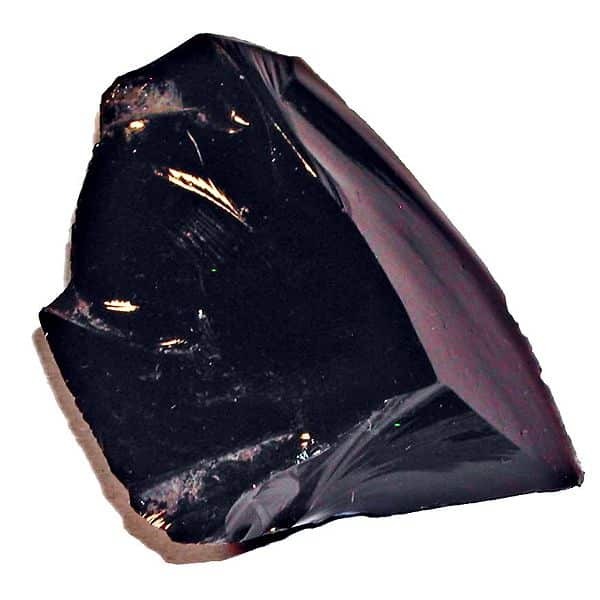 Obsidian gets its name from a Obsius who is said to have discovered it in Ethiopia. Obsidian has been known and used since antiquity. Gem Reference Guide, Los Angeles: Gemological Institute of America, 1988. Pp. 132-134. Newman, Harold. An Illustrated Dictionary of Jewelry, New York: Thames and Hudson, 1981. Pp. 219. Schumann, Walter. Gemstones of the World, New York: Sterling Publishing, Co., 1977. Pp. 212.